Area Rugs anchor a room by pulling coordinating colors together and breaking up the staid milieu of less than flattering flooring. Their texture adds warmth and their colors can liven any space. In short, rugs can accomplish so much in the right room and in many cases make all the difference. 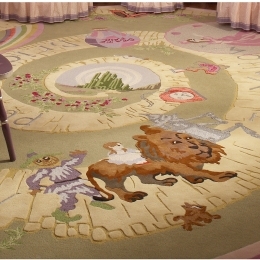 When you take your first look at our beautiful children's area rugs with themes such as Dorothy, Clara and Ariel, imaginations run wild. Whether girl’s rugs, boy’s rugs, best friend or mermaid rugs, each of our offerings is made with the finest materials to exacting standards which will allow them to look great for years to come. So when your imagination takes off, be sure to land on a gorgeous rug from Rooms By ZoyaB.